BY JENNIFER WOODWORTH Beginning with the job search, explore options that relate to your military experience and strengths but also your interests and positive personality traits. Retiring or discharging from active duty can be stressful, and joining the civilian workforce can be intimidating. According to the Office of the Deputy Assistant Secretary of Defense report 2012, there are almost 1.4 million active duty service members serving in the armed forces which equates to approximately .4 percent of the total United States population. Therefore the likelihood that a retired or former active duty military member will be working with civilians is high. Just as there is a learning curve when joining the military, there is a learning curve when transitioning into civilian employment. Just as it took time to learn the job and culture of active duty; it will take time to transition to civilian expectations. Beginning with the job search, explore options that relate to your military experience and strengths but also your interests and positive personality traits. Talk with a Veteran Affairs representative regarding how your job skills translate into language civilian employers will understand, or use tools such as CareerOneStop’s Military-to-Civilian Occupation Translator (link in the Resources section of this article). Also, it is likely that finding employment will take some work; you will not be offered a job solely based on being a former active duty member. Attending employment fairs, utilizing professional connections on social media (ex. LinkedIn), and searching websites can be time consuming, yet a necessary component in finding the right fit for you. Resume Expectations: There are many websites that can assist with resume writing, review, and tips for a comprehensive overview of your skills (Monster, CareerBuilder, Indeed, Simplyhired). Most employers will be looking for your skills that match the need of the position, achievements, special certifications or specific qualifications. If you are applying for a position a significant distance away from your current residence, let the potential employer know that you are willing to relocate for the job. Employers might check your online social media sites, so be sure to review the content before your potential employers view it. You can also use social media to your advantage by creating a professional profile on LinkedIn or other employment sites to create connections and professional opportunities. Job Expectations: Congratulations, you are hired. Now what? 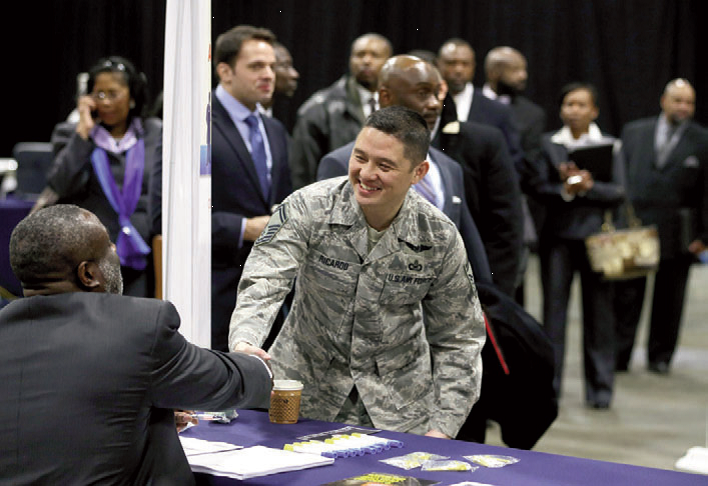 Hopefully, the expectations of the position itself were clear, but there are other areas that can be difficult to navigate when transitioning from military to civilian employment. Learning the culture of that specific organization, company, office, or work center can take time. Interactions with colleagues may feel different in terms of verbal and non-verbal language, hierarchy, management style, and expectations of punctuality, productivity, and social interactions outside of work. It would be advisable to take time to observe your colleagues and employers before offering feedback. Language Expectations: When speaking to civilian colleagues, make sure to use professional language that is understandable in the setting. Avoid using terminology that is only used in the military or in your position when you were active duty. Find alternatives that are able to convey the same meaning but with different words. For example: using the words to describe your team (ie. squadron, platoon, unit) will not be understood in the civilian workplace and could be replaced with colleague or teammate. Also, when speaking about time, it’s important to utilize 12 hour time unless your environment commonly uses 24 hour time (i.e. 5pm instead of 17:00). It will assist you with a smoother transition with your colleagues. Mental Health: Post traumatic Stress Disorder (PTSD) invades every aspect of life including family, social and occupational relationships. Transitioning from a military-based lifestyle, where combat and training experiences may be more understood, to a place where you are in the minority, can be complicated by mental health challenges. You do not have to disclose any mental health issues, including PTSD, to potential employers. However, reasonable accommodations are mandated if you can meet the job qualifications. Understanding your rights can be helpful in maintaining balance between your mental health and pursuit of civilian employment. According to the Americans with Disabilities Act of the Equal Employment Opportunity Commission, it is illegal for employers to refuse to hire or discriminate based on a diagnosis of PTSD or any other mental health condition. Choice of Career Path: If facing mental health or physical injury challenges, finding a job that is going to be comfortable may be difficult. Applying for positions that include confined spaces and loud noises might not be a good fit if you are suffering from PTSD; therefore it is important to be aware of your choices in certain industries. beginning with the organization you have chosen. Additionally, if you have been in a leadership position and held authority, it can be difficult to transition to a position of equality or entry-level position. Your peers will expect you to ask instead of demand and may also not agree or refuse to comply with your request. This can be challenging to contain when you may not be used to being questioned on your decisions. Fitting In: Small talk may not be your thing; however it can create cohesion among colleagues in a work environment. It may be difficult to find compassion for the seeming small inconveniences your peers are complaining about compared to your sacrifices while serving your country. Remember that your peers do not share your experiences, and you do not share theirs; nevertheless you can still find common interests with your peers (travel, sports, food, art) and connect with them in different ways. Structure: When moving into civilian employment, you may find a far less structured atmosphere with increased flexibility in timelines, production, and schedules. The transition may be difficult because the expectations might not be clear or the protocol is not consistent, which varies greatly from the rigid standards of active duty missions. Also, leaving tasks unfinished at the end of the day may be part of the job, yet it can be uncomfortable to leave tasks incomplete. There will most likely be less urgency in completing a task which could create an increase in anxiety or frustration since you are used to being diligent in your job. Further, you might feel that you have a lot of free time on your hands when working only 40 hours with a set start and finish time each day. Jennifer Woodworth graduated from The Chicago School of Professional Psychology – Irvine Campus – in August 2013 with a doctorate in Applied Clinical Psychology. She is a licensed clinical psychologist and will be in private practice in Vista, CA. She has worked in the mental health field for six years, and is a Marine Corps wife of 12 years and mother to three children ages five, seven, and nine.